Parsley the herb needs no introduction; what may is the version of it that is grown not for its leaves but for its root, which is used in a culinary sense much like any other root, such as parsnips. Where once and for long only one seedsman that we know of carried it, suddenly one is seeing it everywhere (well, fairly commonly—when Ferry Morse has it, it’s hit the big time). 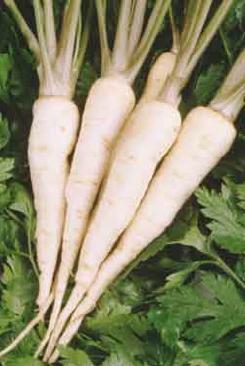 Globally, there are numerous cultivars of parsley root, which occupies a much more important position in European cuisine (especially middle European) than in American eating; we found references to types Arat, Atika, Bartowich Long, Berliner, Dobra, Eagle, Fakir, Halblange, Halblange Fakir, Halblange Perfekta, Halflange Omega, Hamburg, Hanácká, Jadran, Lange, Lange-glatte KP, Lange-glatte RZ, Olomoucká dlouhá, and Orbis. Of those, though, only a few are available in North America by cultivar name, and even of those some are of uncertain status owing to the seedsmen’s atrocious habit of being vague about variety names. Named types that are definitely available in the U.S. include (alphabetically) Arat, Berliner, Halblange, Hilmar, and Hamburg; (“Harburg” is often used as a generic name for this plant, only signifying the “rooted” non-herb sort). We have spent more tedious hours than was wise trying to discover some plausible descriptions of, much less comparisons between, various cultivares. Result: nada. What we did get out of it all was a sense that one might have a modest preference for halblange (“half-long”) types, which grow a little shorter but wider at the shoulder, somewhat stubby looking; that is because that type grows a bit better, especially in heavier-than-ideal soils, and is also somewhat easier to harvest and prepare in the kitchen. There is apparently an actual cultivar named Halblange (though that might be a generic labelling), but other cultivars can also be half-longs. Of the available types, those that are known (to us) to be half-long types are the Berliner, the Hilmar, and of course the Halblange; we just cannot find information on the nature of the type Arat, nor of the type or types called “Hamburg”. What with this and that and these and those, we’d probably opt for the Hilmar variety (one reputable seedsman says of it “Of the several varieties of parsley root we have tried, Hilmar is hands down the most vigorous.”). But probably any of the available varieties would do almost as well. Beware: parsley-root seeds are notoriously short-lived. If you aren’t saving you own seed annually, don’t try to be cheap and use last season’s leftovers—get fresh seed every year. Parsley contains chemicals called furamocoumarins in the seed coat. Because furanocoumarins prevent weed seeds from germinating, the home gardener won’t have to weed parsley quite as often as other plants. But there is a complication—the same furanocoumarins also may interfere with the germination of the parsley itself. Soaking the seeds overnight will reduce to some extent the [otherwise] month-long germination period. That “faking it” for the seeds is all rather tedious, and germination is still slow and often very spotty. An alternative method is winter sowing: direct-seed in late fall and let the seeds overwinter in the ground then come up when they’re jolly good and ready the next spring. The only drawback to this method is tying up the bed space for a long time. But it’s not as if that’s a lot of bed space (and what would you do with it else anyway?). Timing depends on whether or not you’re winter-sowing as decsribed above. If so, timing is not critical, as you don’t expect the seeds to do anything till spring, so just sow them about as late as you can still work the soil. For more conventional direct seeding, we work back from a harvest date: these, like most root vegetables, are better after a light frost or three, and are cold-hardy, so we’ll target an anticipated harvest date at the end of October. The nominal dats to maturity for Hilmar is 120, so we work back to a sowing date of July 3rd. And remember to pre-treat the seed before sowing, as described at the link given above. Parsley roots can tolerate any sort of soil, but—as we noted above—they, and all “roots”, do vastly better on soil that is very loose and friable, else they get stunted, show forked roots, and generally sit in their corners sucking lemons and sulking. For best results, dig your bed so as to loosen the soil as deeply as you can possibly manage, and remove all rocks and as many pebbles as possible, working in organic matter or even straight sand to make it good and loose. They like the more or less standard garden-soil pH of 6.5 to 6.8, or even a little lower, maybe 6.3. Rooted parsley can benefit from a little extra phosphate in the soil. It is also wise to not use much manure in roots beds—and absolutely never any that is not thoroughly composted—or you’ll have forked roots galore. Parsley roots need good sun exposure. Like almost all roots, they are not frost-sensitive. Even going with Mother Nature’s way, we think it wise to plant 2 or 3 seeds at each point where a plant is wanted, then see what emerges and thin—if necessary—to the most vigorous seedling when they look like they’re starting to compete. Parsley roots can be spaced at 4 inches, especially in a deep-dug or raised bed; some sources say 3 inches, but if you want good-sized roots, it’s best not to push the spacing too tight. Parsley root, like parsley as such, requires moist soil. Because the chief part of the plant’s root system—the wanted root itself—lies relatively close to the surface, and the plant is a slow grower both above and below ground, its bed must be kept scrupulously clear of weeds, which would out-compete it for resources. But it is also needful to be correspondingly careful to cultivate shallowly and carefully, to not damage the crop’s own root system. In summer’s heat, parsley root (and parsley) will want a little shade and a deal of water. A small, light framework with latticing to provide sun/shade strips that will move as the sun moves across the sky is a good idea and not much trouble to make. By starting them as late as we do, and considering their slow germination, we should be mostly past the peak-heat days of summer before the matter is an issue—but keep it in mind. The leaves of the growing plant can occasionally be lightly picked over and used like herb parsley; opinion seems to vary widely on the flavor of rooted-parsley leaf vs. herb parsley, with some saying they’re inferior and other finding them just as good as the best herb types. Leave the roots in the ground as late as possible—their flavor, as is typical of true root crops, is improved by their experiencing a frost. But do pull them after the first real frost, and don’t try to store them in the ground over winter. Growing your own: Hamburg parsley - a brief article on growing them in the U.K.
Parsley is another of the highly useful crops in the Umbelliferae family, along with carrots, celery, celeriac, and a host of herbs—angelica, dill, chervil, herb parsley, caraway, coriander, and others more obscure. The ancestral wild parsley is thought to have arisen on the island of Sardinia. The Greeks and the Romans used parsley leaf much as we still do today. In mythology, parsley was believed to have sprung from a Greek hero, Archemorous, the forerunner of death; the Greeks crowned the winners at the Isthmian games with parsley, and warriors fed parsley leaves to their horses. Because parsley was considered as dedicated to Persephone (goddess of the underworld and afterlife) and thus to funeral rites, when Christianity supplanted the old beliefs parsley was consecrated to St. Peter, as the “successor” to Charon. Parsley, long in common use all around the Mediterranean, was brought to England and apparently first cultivated there in 1548. Bentham considered it a native of the Eastern Mediterranean regions; De Candolle, of Turkey, Algeria, and the Lebanon. Since its introduction into the British islands in the sixteenth century, it has become naturalized there. The ancients called two plants—celery and parsley (which are related)—by the general name selinon, but distinguished the two, calling celery heleioselinon, “marsh selinon”, and parsley oreoselinon (“mountain selinon”) or petroselinum, “rock selinon”. That last became, in the Middle Ages, corrupted to petrocilium, and was also variously anglicized as petersylinge, persele, persely, and parsley. In the sixteenth century, Parsley was known as A. hortense, but herbalists retained the official name petroselinum. In 1764. Linnaeus classified it A. petroselinum. There are, it seems, an inordinate number of Superstitions About Parsley. It was last modified on Friday, 1 February 2019, at 16:58 EST.